Witness was outside his home in Cali, Colombia and while talking on the phone he noticed something strange in the night sky. A small ball shaped UFO-like object suddenly appears between the clouds, then the object produces a weird noise for at last 8 seconds and multiplying itself from the right to the left. After the smaller object has multiplied itself into one bright object it started to disappear again, one by one, according to the witness. He has filmed the strange sighting on September 23, 2017 and said that he never has seen something like that in his entire life and although he was a little scared he was very excited to have witnessed something in the sky what he described as a UFO sighting. 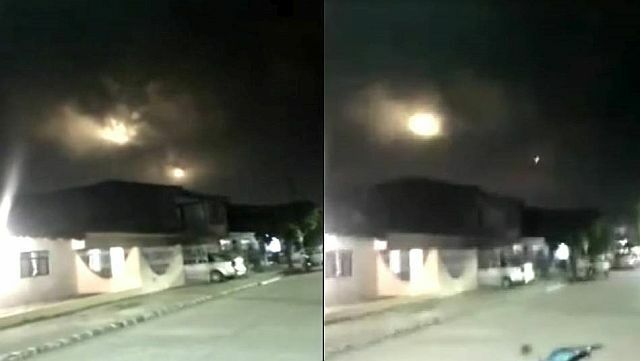 Note: Although the poor quality of the video, the first bright object seems to be the moon, a possible explanation for the second bright object could be ball lightning which is an unexplained atmospheric electrical phenomenon, though it not explains the strange noise and the fact that it multiplied itself before disappearing again, one by one. Anyhow, see the video below and decide for yourself.